“Welcome as India after Gandhi is for its initiation of a new field of contemporary historiography, one is left half-yearning for the book Guha did not write”. 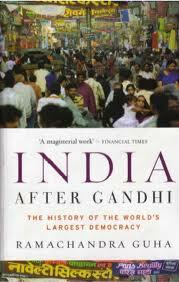 “Guha offers no overall theses as to how the India of 1947 became that of today. Instead he embarks on a narration of political events, deftly interwoven with socio-cultural and economic developments. Along the way he provides a set of individual political profiles, often interesting and amusingly drawn. One occasionally feels that he overuses this strategy, especially since, barring a few individuals—Nehru, Patel, Sheikh Abdullah, Indira Gandhi or Jayprakash Narayan—many were not as significant as the character-driven plot structure, weighted towards party leaders, makes them out to be. Other social forces and structures are inevitably downplayed”. The narrative is “uncritical” based on “journalistic sources”. “More broadly, what is missing in terms of Guha’s framing questions is any analysis of the tensions between national unity and democracy, and the ways in which the concerns of the former—military security, internal sovereignty—have not infrequently hollowed out the content of the latter”. Sarkar finds many “large questions, which Guha does not address”. But why? “This is not an incidental drawback, but flows from the liberal-Nehruvian nationalism that is the book’s chief ideological marker”. HENCE, Ramachandra Guha’s book is more an exercise in story-telling – “a thoughtful survey of the period in fluent, lucid prose”.